Association of phytoplasma with Huanglongbing (HLB) disease is reported here for the first time in Citrus grandis from India. Molecular investigation of the pathogen reveals that it belongs to 16SrXIV Group of phytoplasma, ‘Candidatus Phytoplasma cynodontis’. The association of phytoplasma with HLB accentuates that there is need to broaden the disease management strategies. Huanglongbing (HLB) or citrus greening disease is one of the most destructive citrus diseases and causes extensive economic losses to the citrus industry in India and most of the citrus growing regions of the world (Ghosh et al. 2015). 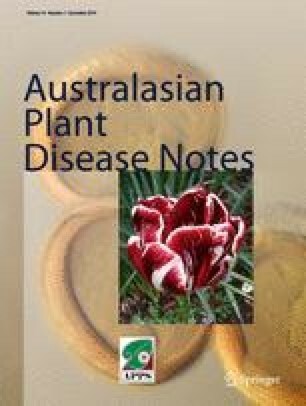 Although the disease is primarily associated with ‘Candidatus Liberibacter spp.’, a group of gram-negative, phloem-limited a-proteobacteria, there are some reports which also link HLB with phytoplasmas (Lou et al. 2014; Das et al. 2016). Citrus leaf samples showing typical HLB yellow mottling symptoms were found positive with phytoplasma belonging to different groups like 16SrIX in sweet orange from Brazil (Teixeira et al. 2008), 16SrI in mandarin, sweet orange and pummelo and 16SrII in grapefruit from China (Chen et al. 2009; Lou et al. 2014), and 16SrVI in mandarin from India (Das et al. 2016). To study the HLB association with phytoplasma in more cultivars from India, a survey was conducted during 2017–18 in Nagpur District of Maharashtra state. Leaf samples of 20 pummelo (Citrus grandis) plants showing yellow mottling symptoms were collected (Fig. 1). The collected samples were washed then wiped with 70% ethanol to avoid any surface contamination. Midribs and petioles were excised and ground in liquid nitrogen, and 100 mg of the powdered sample was used for DNA extraction using the DNeasy Plant mini kit (Qiagen, Hilden, Germany) according to the manufacturer’s protocol. The presence of ‘Candidatus Liberibacter asiaticus’ was tested using previously described polymerase chain reaction (PCR) amplification of 16S rRNA region with primer set OI1/OI2c (Garnier et al. 2000). To determine association with phytoplasma, the samples were analysed using P1/P7 universal primers specific to phytoplasmas for the first round of PCR and the products were subsequently amplified with nested primer pairs R16F2n/R16R2 and Fu5/Ru3 (Lee et al. 2004; Lou et al. 2014; Ghosh et al. 2017). Among 20 samples, 13 were found to be positive only for HLB and 2 were positive for both HLB and phytoplasma. The amplicons of expected band length, ~ 1.2 kb for OI1/OI2c (Fig. 2), ~ 1.2 kb for R16F2n/R16R (Fig. 3) and ~ 0.88 kb for Fu5/Ru3 (Fig. 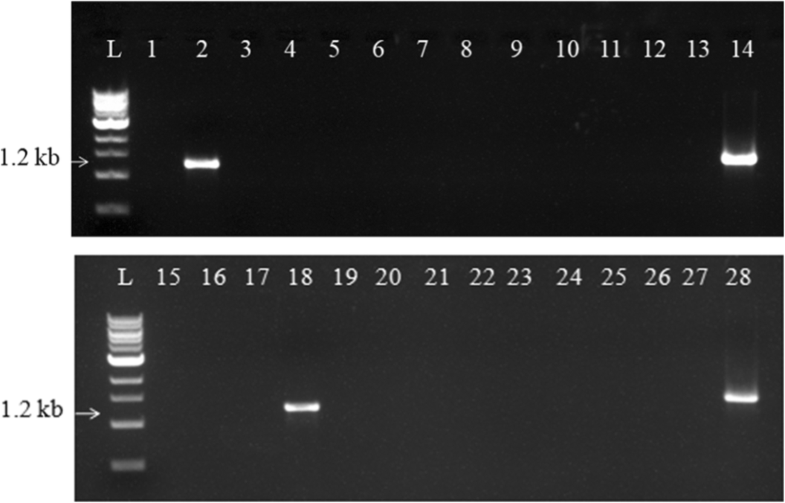 4) were observed on 1% agarose gel. The positive phytoplasma sample (DNA) used in the study was ‘Candidatus Phytoplasma trifolii’ (16SrVI group) donated by Dr. G P Rao, IARI, Delhi. The negative control was a healthy sample, free from the pathogens and maintained in an insect protected poly-house at ICAR-CCRI, Nagpur. Amplicons obtained with primer set R16F2n/R16R were purified, sequenced (Eurofins, Bangalore) and deposited in GenBank. Both the sequences were identical with each other. NCBI-BLAST analysis showed that the HLB phytoplasma isolate from Nagpur (GenBank accession number MK041924 and MK012544) shared the highest identity (99%) with ‘Candidatus Phytoplasma cynodontis’ strains (LT558777, KM220612, AB741630). Phylogenetic analysis of 16S rRNA sequences was done using software MEGA 7.0 by maximum likelihood method with 1000 bootstrap value (Tamura and Nei 1993). 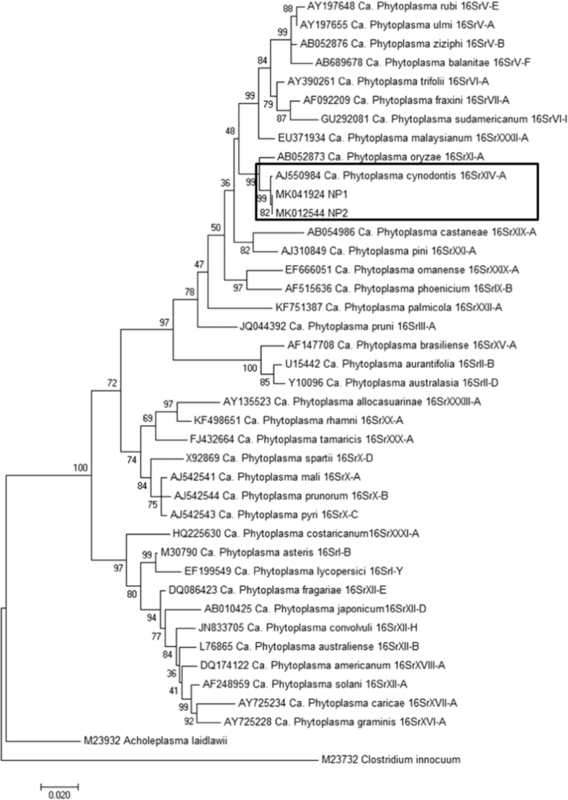 The phylogenetic tree showed that the samples formed a distinct clade with ‘Candidatus Phytoplasma cynodontis’ isolate BGW1-C1 (Fig. 5). 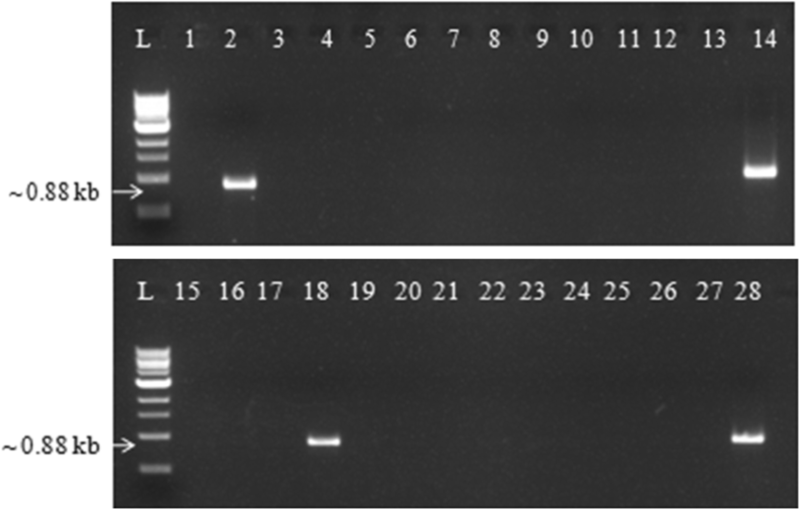 In-silico RFLP analysis of R16F2n/R16R2 sequence of sample NP1 was performed with 17 restriction enzymes (AluI, BamHI, BfaI, BstUI, DraI, EcoRI, HaeIII, HhaI, HinfI, HpaI, HpaII, KpnI, MseI, RsaI, Sau3AI, SspI and TaqI) using iPhyClassifier online tool (Zhao et al. 2009). The virtual RFLP pattern was found to be similar with the reference pattern of 16Sr group XIV, subgroup A (AJ550984). To the best of our knowledge, this is the first report of association of ‘Candidatus Phytoplasma cynodontis’ (16SrXIV) strain with HLB in India. It will be interesting to identify whether any other Phytoplasma groups are also associated with HLB, any synergistic effect of both ‘Candidatus Liberibacter asiaticus’ and ‘Candidatus Phytoplasma cynodontis’ on symptom expression in infected plant and also to identify any potential insect vectors and plant reservoirs in this region.